Vaulting is ideal for building confidence, balance, teamwork, and a solid foundation for any style of riding. 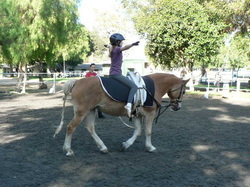 Many students have taken vaulting lessons as a means of improving their riding skills. Exercises begin by working on a barrel or the Equicizer and progresses into riding in walk, trot and finally in the canter. Others find it a challenging and unique sport in itself. Vaulters compete as individuals, pairs or pas-de-deux, and teams. Vaulting competitions are comprised of compulsory exercises and choreographed freestyle exercises done to music. Beginning vaulters will compete at the walk and the trot. 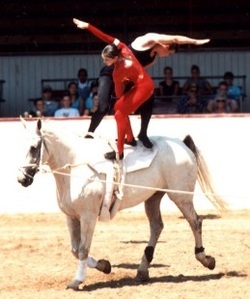 Upper level vaulters perform on the horse at a canter. The vaulting horse, which has been carefully trained, moves in a 15-meter circle and is controlled by a longeur (or lunger). Each exercise is scored on a scale from 0-10. Horse, lunger and vaulter are considered a competitive unit and the performance of each is reflected in the final score. The kur is a one minute freestyle composition and is judged on harmony with the horse, composition, and the degree of difficulty of the movements chosen. Vaulters also compete in freestyle (previously known as Kur). The components of a freestyle vaulting routine may include mounts and dismounts, handstands, kneeling, standing and aerial moves such as flips. Teams will also carry, lift, and toss another vaulter in the air. Judging is based on technique, form, difficulty, balance, security, and consideration of the horse and lunger. Barrels (or "practice horses") are used to introduce vaulting, develop and perfect various moves and for practice time during a lesson. Barrels are for both compulsory and kur practice. It is also a means for vaulters to gain confidence since they can master the exercises on a stationary object before trying them on a moving horse. It can be used indoors in a climate controlled environment. By working hard on the barrel, vaulters are able to get the most out of their time on the horse. Most vaulting events also include barrel competitions. Many people, from adults to very young children, learn to vault just for the fun of it. The Vaulting Academy also use an Equicizer (www.http://www.equicizer.com) instead of a barrel. Therapeutic Vaulting is also used as form of physical therapy or treatment for children and adults who may have balance, attention, motor skill or social deficits. Special needs vaulters of all ages learn to better themselves both physically and mentally through this unique sport. The increase in motor skills, balance and co-ordination along with teamwork and discipline is there for all to see. Recreational Vaulting can be done in a private session or group session, with a horse or with a barrel or the Equicizer. Group sessions will allow participants to work within a group sharing not only the horse but also their experiences. It allows time to watch, relate and to explore feel, rhythm, timing and balance. Vaulting is also a great activity for teaching children to understand the needs of others within their team. It also helps riders to overcome problems with personal space. The vaulter gains harmony with the horse whilst having no responsibility for the control of the animal. Vaulting increases trust and confidence in their own ability which leads to greater security. The horse is a powerful motivator and this activity has developed huge amounts of fitness and self esteem in the participants. Often recreational, competitive and therapeutic vaulting is merged, where able bodied riders learning to work with those with disabilities and special needs and support them throughout their sessions together.